Over a recent three week period, our Vikings resident Multi-Class S9 swimmer, David Bale, made the big trips to Sydney and to Adelaide, respectively, for the 2019 NSW State Open Championships and then the 2019 Hancock Prospecting Australian Swimming Championships. David is an enthusiastic (and quick!) 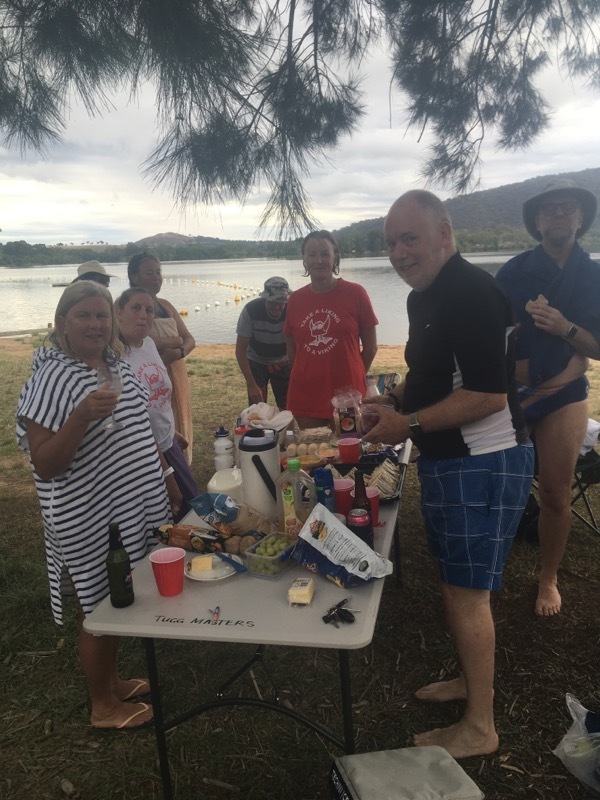 swimmer for both the Tuggeranong Vikings adult swim squad and the Tuggeranong Vikings Masters swimming club. The NSW event, held at Sydney Olympic Park Aquatic Centre (SOPAC) 15-17 Mar 19, saw David competing in five events, and qualifying for three finals. In the process, he managed to improve two of his personal bests: for the 200m IM (by 3.0 seconds) and the 100m BU (by 2.5 seconds). Event results are on the Swimming NSW website. This was a great lead-in for David’s participation in the Australian Championships a few weeks later (07-12 Apr 19) at the SA Aquatic & Leisure Centre in Adelaide. David qualified for three events – 50m BA, 50m FR and 100m FR – and, this time, racked up another two personal bests, including an improvement by a full second in the 50m BA for a very respectable 36.26 seconds! The winner of this event was obviously pushed very hard, setting a new world record for the S9 classification. Full results are available on the Swimming Australia website. 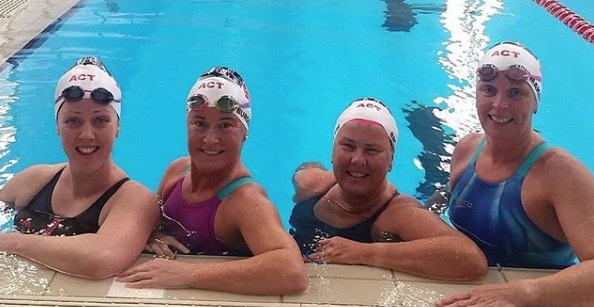 The 2019 MSA National Championships were held in Adelaide from 19-23 March at the SA Aquatic & Leisure Centre, Oaklands Park. Over 400 swimmers from all over the country competed, as well as a few visiting Masters swimmers from NZ, USA, UK and Canada. 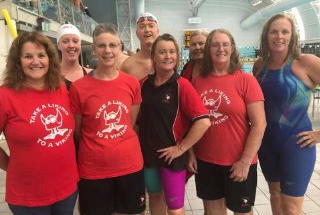 Tuggeranong Vikings were represented by a team of ten swimmers (and supporters! ), consisting of Katrina Burgess, Leisa Cass, Donna Campbell, Brian Curtis, Lisa Haureliuk, Paul Maggs, Caroline Makin, Ann Reid, Anne Smyth and Ron Watkins. As well as enjoying the social aspects, all swimmers swam well with numerous PB swims and multiple podium finishes. Overall, the club ended the meet in 13th position from a field of 86 clubs. Not too shabby! As well as the women’s medley and freestyle relay team, notable individual results included triple gold to Caz Makin in the 200, 400 and 800m FR as well as another gold in the 50m BK , and Ron Watkins’ gold in 50m BU. For those that just couldn’t get enough, the meet also included, unusually, a 1.5 or 3.0km open-water swim at Brighton Beach on day five following completion of the four days of competition in the pool. 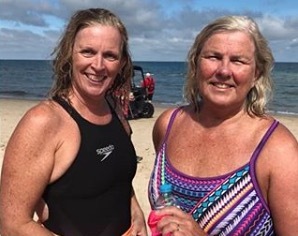 Both Caz and Anne took the plunge in the choppy 1.5km event – cheered on by some Vikings who stayed dry and comfortable on the jetty – with Caz taking home a gold, and Anne a silver medal. It was a particularly strong meet for the Canberra women, with Caz taking the crown as National Champion in her age group, and Lisa gaining equal second overall in her age group, and both Ann Reid and Donna Campbell swimming the maximum allowable twelve individual events over the four days of competition. Full event results are at the Masters Swimming Australia website. Next year’s event will be run in Short Course format at Sydney Olympic Park Aquatic Centre (SOPAC). For the first time ever at our Nationals, multi-class participants will be able to swim in their own multi-class categories within the program. Just enough time to get training! Posted in: Club, Competitions, Results, Social. The Canberra Day holiday long weekend of 09-10-11 March 2019 saw a few extra ACT numberplates amongst the crowds on the highway over to the coast. 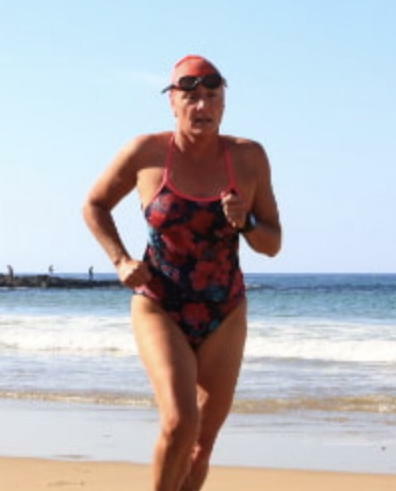 Two Vikings – Nicolee Martin and Al Byrne, as well as one former Viking – Petrina Quinn, made the trip to beautiful Broulee on the NSW South Coast for the eighth annual Broulee Bay to Breakers Ocean Swim, held on Sunday 10 March 2019. This is a 1400 metre ocean swim from Broulee Island to South Broulee Beach, first held in 2012 (then featuring two Vikings ladies amongst the field of 178). To the delight of the hosts at the Broulee Surfers Surf Life Saving Club (SLSC), a record-breaking field of over 400 swimmers signed up this year! As well as the usual senior male/female ‘age’ categories, the event also included a complementary 500 metre junior event for under 14 and under 12′s. For the diehards (ie: Nicolee and Petrina), the age category events were followed shortly thereafter by an ‘open’ swim – repeating the full course a second time! On an absolutely sparkling sunny morning, the day started with the usual safety briefing in front of the Surf Club on South Broulee beach. 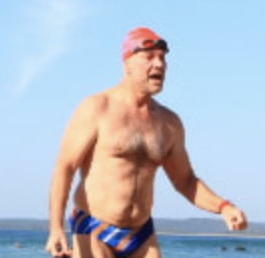 Swimmers and supporters then made their way on foot the 400 metres around the headland to the start line at Broulee Island. 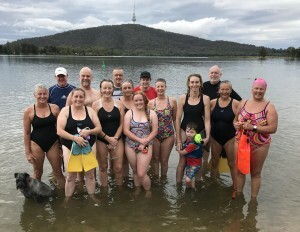 The three groups of senior swimmers entered the water in sequence, with the main groups as well as the outliers well protected enroute by a range of SLSC paddlers, jet-skis and inflatable rescue boats (not to mention a drone overhead!). With a relaxed atmosphere, a ‘not-too-cold, not-too-hot’ water temperature of about 21.5 degrees, a gentle swell and good visibility in the clean ocean water, it was always going to be a great experience – and it certainly was! Extensive photo coverage of the event is now online.